Watch a preview of the new Winsanity TV show, premiering on GSN Thursday, June 9, 2016, at 9:00pm ET/PT. 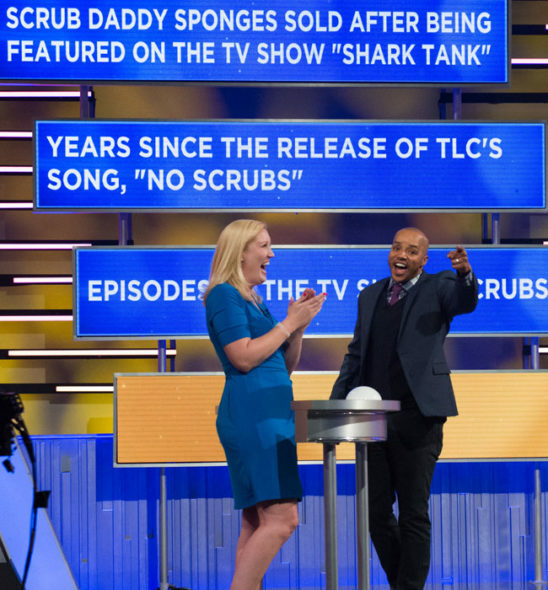 A new game show hosted by Scrubs star Donald Faison, offers prizes to both the contestants and studio audience. Comedian Kira Soltanovich is the announcer. Watch the Winsanity TV series promo, now. Get more information from this GSN press release. Every Time A Contestant Wins A Prize, So Do Members of The Studio Audience, But One Wrong Answer and They Lose Everything! May 12, 2016, SANTA MONICA, Calif. — GSN, the leader in game shows and competitive entertainment, will debut its innovative new game show series, WINSANITY, on Thursday, June 9 at 9:00 pm ET/PT. 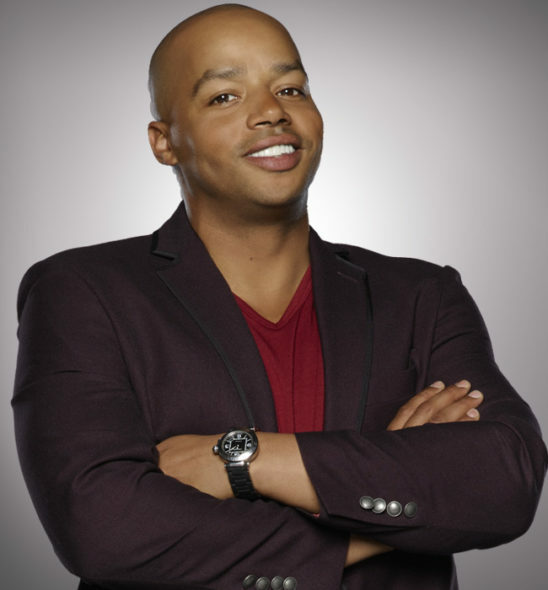 The series, hosted by actor Donald Faison (“Scrubs”), is unique in that the game play offers the opportunity for prizes to be won not only by the contestants but also by the studio audience. GSN has also partnered with participation TV technology company iPowow to allow viewers to play along at home in real-time for a chance to win prizes throughout the season. Each half-hour episode of WINSANITY features a contestant attempting to rank ten compelling and surprising facts in numerical order, from lowest to highest (i.e. : Which is greater: the number of marriages each year in the US, or the number of President Barack Obama’s Twitter followers?). Every time a contestant is correct and wins a prize, so does a randomly selected portion of the studio audience. However, if a contestant gives a wrong answer at any point, they, and the audience lose everything, and a new contestant takes his or her place and continues the game, trying to win prizes that increase in value with each round. Faison, who will serve as host of the show, is best known to TV viewers for his long-running role on the hit TV series “Scrubs” and the classic teen film and TV series “Clueless.” He also starred in the TV Land series “The Exes” and Pepsi’s recent digital series, “Camp Halftime,” part of their 2016 Super Bowl ad campaign and first-ever halftime show. A two-time winner of the BET Comedy Award, Faison has also been nominated multiple times for the NAACP Image Award and Teen Choice Awards. Comedian Kira Soltanovich (“How To Be A Grownup”) also serves as announcer. Kira has appeared on The Tonight Show with Jay Leno (for 8 years), Jimmy Kimmel Live, Last Call with Carson Daly, Hell’s Kitchen, and Last Comic Standing among others. Her new one-hour comedy special, You Did This To Me was self-produced and shot while she was over seven months pregnant. WINSANITY is produced by Electus for GSN. Executive producers are Chris Grant of Electus and Barry Poznick of Barracuda Television Productions, Inc.
iPowow, the leaders in Participation TV, enable the real-time gathering and visualization of the broadcast audience’s reaction and response to the story unfolding on television. Broadcast and brand partners include ABC/Disney, Viacom, ESPN, Fox Sports, Comcast/ NBC Universal, CNN/ Turner Broadcasting, Red Bull Media House and USA Network. For more information go to http://www.ipowow.com. What do you think? Do you like the sound of the Winsanity TV series? Do you think you will check out the premiere? More about: GSN TV shows: canceled or renewed?, Winsanity, Winsanity: canceled or renewed? I won 222$ on winsanity in April it’s now November and they said check would be sent in the mail!!! Does anyone else have this problem? Went to winsanity as audience member. Funny, enlightening, it was great! The audience assistants were all so nice and accommodating. Warm up guy was very entertaining. Overall a tremendous experience for my out of town relatives. They loved it! Thank you to Winsanity — Hope to be able to watch for years to come! You rock! I was on a live show Feb 8,2016 won a EBag gift certificate for $100.00 never received?? Will someone contact me its been almost a year. Have you received your price yet? Two of my friends and I went in April 2017 and have also not received anything. I have even emailed them. STARR…..T LOVE THE SHOW…WHERE DO I REGISTER TO PLAY ALONG AT HOME?